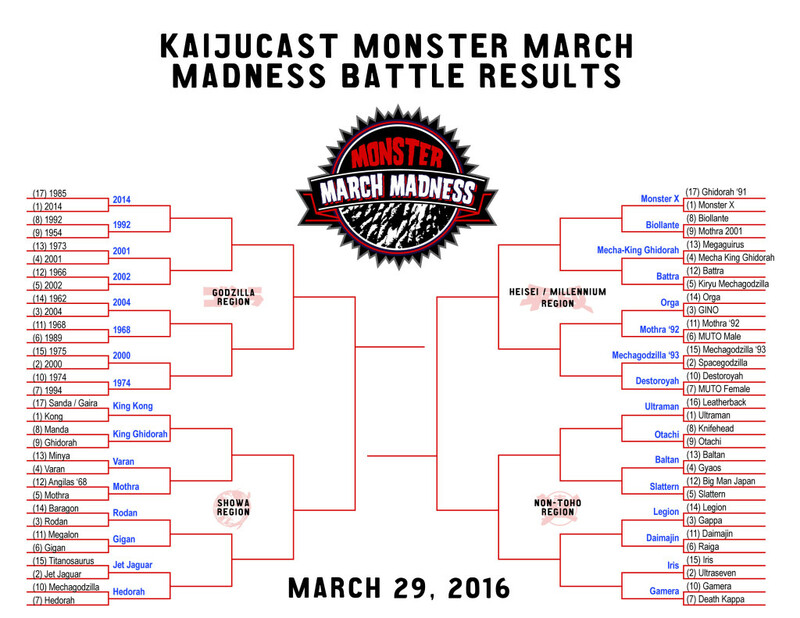 Monster March Madness begins with this special elimination episode of the Kaijucast! In a bit of a break from our normal fare, the Kaijucast has embarked on what could easily be an annual event here and we really hope you enjoy this as much as we did while recording the episode. 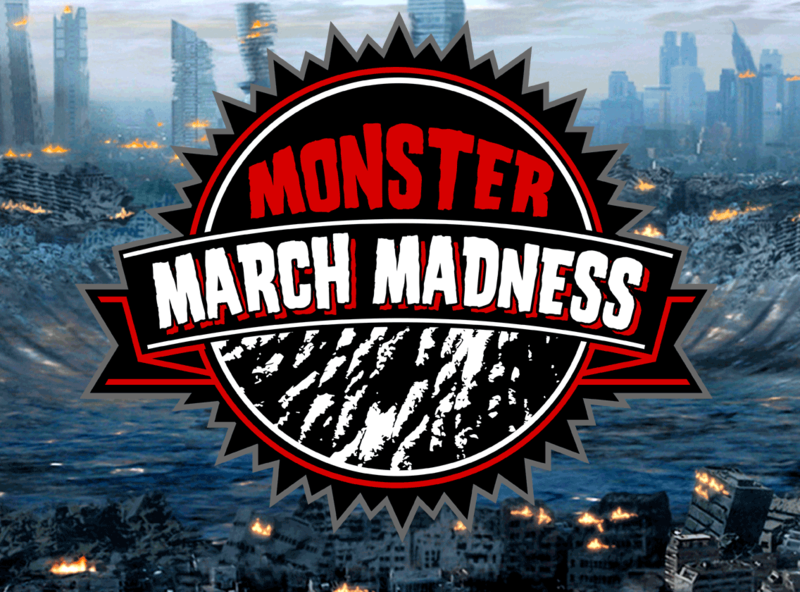 The rest of the world seems to be obsessing over the NCAA tournament, but we continue our life-long obsessing over giant monsters from the land of the rising sun and have launched a new series of episodes and segments entitled MONSTER MARCH MADNESS! If you didn’t listen to episode #168 (in which Keith Foster and I detail how this entire thing works), this is a round of 32 elimination battles that will determine this year’s winners of kaiju supremacy. Big thanks to everyone who submitted their brackets for the tournament and to our panelists! 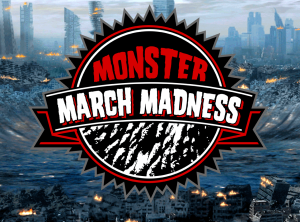 We’ll be back with another round of Monster March Madness results at the end of our daikaiju discussion episode in just a couple of days. Here are the results from the first exciting round of elimination battles! Results from round one of our elimination matches (click to embiggen* this image). 1985 vs 2014 :: 2014 WINS! 1992 vs 1954 :: 1992 WINS! 73 vs 2001 :: 2001 WINS! 66 vs 2002 :: 2002 WINS! 1962 vs 2004 :: 2004 WINS! 1968 vs 1989 :: 1968 WINS! 1975 vs 2000 :: 2000 WINS! 1974 vs 1994 :: 1974 WINS! Sanda & Gaira vs. King Kong 1962 :: King Kong WINS! Manda vs Ghidorah :: Ghidorah WINS! Minya vs Varan :: Varan WINS! Angilas vs Mothra :: Mothra WINS! Baragon vs Rodan :: Rodan WINS! Megalon vs Gigan :: Gigan WINS! Titanosaurus vs Jet Jaguar :: Jet Jaguar WINS! Mechagodzilla vs Hedorah :: Hedorah WINS! Ghidorah ’91 vs Monster X :: Monster X WINS! Biollante vs Mothra 2001 :: Biollante WINS! Megaguirus vs Mecha-King Ghidorah :: Mecha-King Ghidorah WINS! Battra vs Kiryu Mechagodzilla :: Battra WINS! Orga vs GINO :: Orga WINS! Mothra ’92 vs MUTO Male :: Mothra 92 WINS! Mechagodzilla 93 vs Spacegodzilla :: Mechagodzilla 93 WINS! Destoroyah vs MUTO Female :: Destoroyah WINS! Leatherback vs Ultraman :: Ultraman WINS! Knifehead vs Otachi :: Otachi WINS! Baltan vs Gyaos :: Baltan WINS! Big Man Japan vs. Slattern :: Slattern WINS! Legion vs Gappa :: Legion WINS! Daimajin vs Raiga :: Daimajin WINS! Iris vs Ultraseven :: Iris WINS! Gamera vs Death Kappa :: Gamera WINS! *Simpsons references for the win, right? ?